A bit dated, but saw this recently on a forward. Chennai Silks, India has woven the world’s costliest silk saree worth Rs. 40 lakhs (96,000 USD). The weavers incorporated gold thread as well as precious stones into the saree. Not only will it lighten the wallet, wearing the 8 kg saree (17.6 lbs) may cause the wearer to lose weight. The exceptionally stunning sari is woven with 12 precious stones including diamonds, ruby, emeralds, yellow sapphire, topaz, pearls and corals. Gold, platinum and silver threads are used in the weave and together with the gems depict 11 of Raja Ravi Varma’s popular paintings. Woven on the “pallu” is ‘Lady Musicians’, one of Ravi Varma’s famous works paying tribute to women of diverse cultural backgrounds. It took 30 weavers, seven months to make the saree. I am thankful that during M’s saree shopping binge in Chennai, we did not come across this saree! lol! i am just thinking of the condition of hubby who’s wifey might have ask for this gift. btw, nice one. especially i loved the art work. lovely. Obviously, beauty is in the eye of the beholder, … or in this case, whoever is willing to shell out the bucks. Really you have got latest information on the new fashion trends. Just few days back my mom purchased sari from kaneesha dot com of exactly TV soaps actress style. She is highly satisfied and why not after receiving great compliments! oh my god,this model is definitely the Luckiest model in India. M would be terrified of wearing it; in case someone spills something on it, or rips it. Yikes! Yes, it will be shown a lot; but worn very infrequently! Whoa, would definitely be in closet forever, with this amount of weight, it will sure give me body-aches..
Its been a long time before anyone called me aNNa! my chest is bloated! 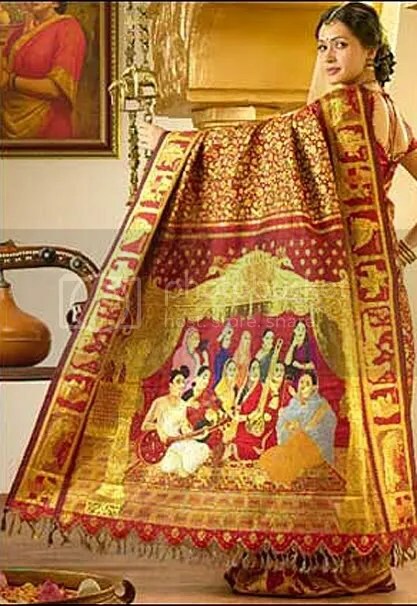 Please let me know if you come across any other saree wth Ravi Varma’s paintngs – which are not so expensive. I don’t want gold, silver and all, but I simply love those paintings :). Well…I dont think even that will make me wear a saree…although sometimes I do wear them to make aayi happy :)), but I definitely would like to have one in the closet :D.
Lucky you! Glad you enjoyed that Jolada Rotti Oota! Jealous! heh – we are off to india in July, though not to Bengaluru! Will certainly be trying various cuisines then. Ok, you wouldn’t wear it – but wouldn’t you want to own it! Perhaps wear it for a few minutes (so I can take pics) and then put it away in a safe? Oh wow. While I think it’s fantastic that Ravi Varma’s painting is on a sari, I don’t think I would wear that sari (even though the Malayalee in me thinks it’s fantastic that Ravi Varma’s painting is getting a little exposure). Plus I’d probably not be able to last ten minutes in that sari, let alone a whole day, given that I’d be hauling around almost twenty excess pounds.